Ask any mortgage broker and they can tell you that there are a handful of misconceptions that the public has about working with a mortgage broker. From questioning their credentials (we all are regulated and licensed with in our own province, and are constantly re-educating ourselves) to assuming that the broker does not have access to the same rate as the banks (we do in fact—plus access to even more lending options) mortgage brokers have heard it all! Myth 1: Independent Broker’s don’t have access to the rates the banks do. This extensive network of lender options allows brokers to ensure that you are not only getting the sharpest rate, but that the mortgage product is also aligned with the client’s needs. Myth 2: The consumer has to negotiate a rate with a lender directly. Myth 3: A Broker’s goal is to move the mortgage on each renewal. Myth 4: The broker receives a trailer fee if the client remains with the same lender at renewal. Fact: This is on a case-to-case basis. At times, there is a small fee given to the broker if a client opts to renew with their current lender. This allows for accountability between the lender, broker, and customer in most cases. However, this is not always the case and the details of each renewal will vary. Myth 5: If a Broker moves a mortgage to a new lender upon time of renewal then the full mortgage commission is received by the broker, allowing the broker to obtain “passive income” by constantly switching clients over. Fact: Let’s clarify: If a client chooses to move their mortgage at renewal after a broker presents them with the best options, then it is in fact a new deal. By being a new deal, this means that the broker has all the work associated with any new file at that time. It is the equivalent of a brand-new mortgage and the broker will have to do the correct steps and work associated with it. A second point of clarification-although the broker will earn income on this switch, the income (in most cases) is paid by the financial institution receiving the mortgage, NOT the client. Myth 6: It costs a client more to renew with a mortgage broker. Fact: Completely false. Clients SAVE MONEY when they work with a mortgage broker at . A broker has access to a variety of lenders and can offer discounts that the bank can’t. Additionally, most mortgage brokers offer continuous advice and information to their clients. Working with a broker is not a “one and done” deal as it is a broker’s goal to keep their clients informed, educated, and well-versed as to what is happening in the industry and how it will affect them. When you work with a broker instead of the bank, you not only get the best mortgage for you, but you also have access to a wealth of industry knowledge continuously. Mortgage Brokers are a dedicated group of individuals who work directly for the client, not the lenders or the bank. Brokers are problem-solvers, advisors and honourable individuals. We work hard to give our clients the best that we can in an industry that constantly is evolving and changing. We encourage you to reach out to your local Dominion Lending Centres mortgage professional if you have any misconceptions or questions about working with a broker-we are happy to answer them and help you with your mortgage, your renewal, and everything and anything in between. Thanks to DLC’s Geoff Lee for this info! Low Rate or Low Borrowing Cost? Would you rather have the lowest mortgage rate or the lowest borrowing cost? If you picked the latter, good for you. You’re mortgage savvy, and you’re in the minority. Check out this chart from a recent Manulife survey. 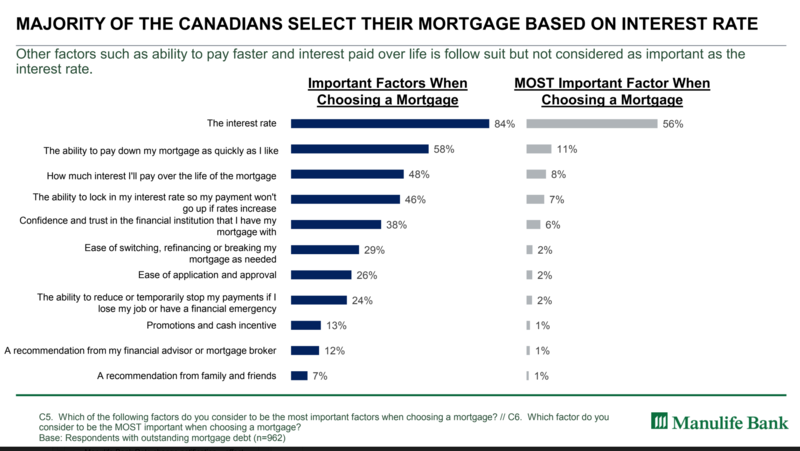 Its findings show that the “interest rate” dominates all other factors when consumers pick a mortgage. That’s great news for a rate comparison site like this one, but it’s not great news for borrowers. According to respondents, “how much interest I’ll pay over the life of the mortgage” is far less important than the rate. That’s like judging the fastest sports car by horsepower alone. One metric doesn’t tell the whole story. The interest rate reflects but one component of mortgage cost (the regular interest expense). It doesn’t reveal the other ways lenders “get ya” in the pocketbook. The reason the interest rate is such a dominant consideration for borrowers is because most people can’t quantify what else a mortgage lender might charge them. Less favourable registration methods — e.g., collateral charge mortgages, which are inappropriate for many. If drawbacks like these never affect you, then selecting the lowest rate (for the most suitable term) will save you the most money. But the odds are against you not needing flexibility. The statistical reality is that most people change their mortgage sooner than every five years. And that’s where the fine print in a lender’s contract can easily cost you the equivalent of 0.10% to 0.50% extra interest per year. objectively compare all this information. In practice, that’s near impossible for most consumers, and even for most bankers and brokers. This is why so many borrowers focus on the rate instead of what they may actually pay. At the Spy we’re developing technology to make this analysis process easier for you. It’s a ginormous programming undertaking, but it’s coming and we’ll keep you posted. In the meantime, don’t be afraid to pay a little extra for a highly flexible mortgage, especially if you’re locking into a 5-year fixed rate. Five basis points more on the rate could save you 20 after closing. True fact. Posted originally by Rate Spy Staff. Every week I do a LIVE “Mortgage Minute” to keep you up to date on the current news and topics of the week relating to mortgages, real estate, homes and more! Check it out LIVE here! Don’t let procrastination, or the fear of rejection, failure and mistakes get in the way of taking the first step towards homeownership in 2018. 2) Make a plan- with me!! These things don’t happen overnight. It’s not as if you wake up one day and say, hey, I’m going to buy a home. At least not for the majority of us. So just taking the first step to find out what you can afford and what you may need to prepare for will get you on track and I promise, it’s not as scary as you think!! Call me at 604.725.1607 or email me at jordan@citywidemortgage.ca for a free and confidential consultation. BC Assessments are in and the latest Stress Test is officially upon us! Every week I do a Mortgage Minute to keep you up to date on the news and topics of the week relating to mortgages, real estate, homes and more! This week’s Market Commentary by Jason Ellis looks at the unemployment rate, bond yields and credit and market news.